A car loses snow from its roof as it drives over the dip on I-90 near Kellogg. 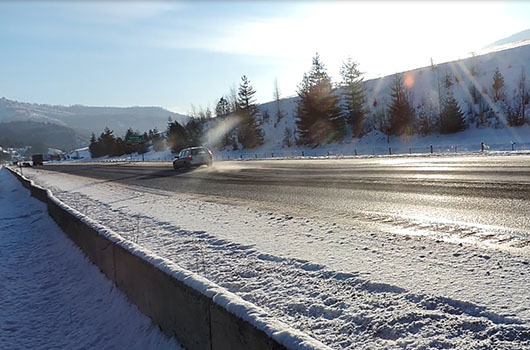 Drivers are advised to reduce speeds on Interstate 90 near Kellogg due to a dip in the road. Watch this video to see vehicles drive over the dip. New signage near milepost 48.6 encourages drivers to drop from 75 mph to 45 mph in the area of the depression. Drivers should pay attention to signage as speed limits may change in accordance with roadway conditions. The depression appears to be caused by water running under the roadway. The Idaho Transportation Department is monitoring the area and investigating the source of the water to develop a long-term solution. Roadway issues like this typically require deep excavation and reconstruction of the road base. ITD is exploring options to temporarily fill in the dip as early as next week. In the meantime, drivers are encouraged to reduce their speeds.